Solutions Marketing & Consulting - Car FBT - Statutory or Operating Cost? Which method to choose? There are potentially substantial savings to be achieved by choosing the Operating Cost method over the Statutory Cost method. Read below to know which method is likely to be better for you. If you would like your particular situation modelled, just call me and tell me the cost of your car in year 1 (or if leased, the annual lease cost), the annual km's travelled and the % of Business mileage and I will help you with an approximate answer to the above question free of charge. On Tuesday 16th July 2013, the Australian Government, via the Federal Treasurer Chris Bowen, announced the removal of the FBT Statutory formula for company cars (tool of trade) and also Novated Leases, with effect from 1st April, 2014. This meant that any commitment made after the announcement was made (on 16 July 2013) would now have to use the Operating Cost Method and actual business vs. private usage. For those companies and drivers already using this method, the announcement created no impact. But for new users, the FBT calculation method would no longer be a choice - the only option for calculation would be the Operating Cost Method from 1st April 2014. This caused havoc within the Novated lease industry and the car sales industry with buyers opting out from the purchase of new cars. Almost immediately, 300 specialist finance professionals lost their jobs, and 3,000 more related jobs were under a cloud. Demand for new cars nosedived – with both Holden and Ford (the two most embattled local car makers) experiencing profound sales reductions in August, putting their sales near 20-year lows. Basically, thanks to the mechanism known variously as ‘salary sacrifice’ or ‘Novated leasing’ an FBT concession is once again available on the purchase of a vehicle – regardless of whether the vehicle is used for wholly personal use, or a combination of business and personal. Importantly, under this so-called ‘statutory’ method, no arduous log book record keeping is required. Now, Novated lease companies will often tell you that “The concession means that FBT is payable on just 20 per cent of the vehicle’s use, regardless of the actual proportion of personal use. (Essentially, it’s assumed the personal use proportion is 20 per cent – and FBT is charged on that.) The remaining 80 per cent is once again FBT-free. However, this statement is incorrect! What is the true difference between the Statutory Method and the Operating Cost Method? And which method is best for particular cases? In other words under what circumstances should one consider moving from the Statutory Method to the Operating cost method, despite the fact that this latter method requires the keeping of a 3 month log book of Business vs. Private Mileage once every 5 years? The net taxable value of the benefit is simply 20% of the cost of the car (incl. GST). Then the Net taxable value is uplifted by 2.0647 if the company is registered for GST. (If not the uplift factor is 1.8692). Then the result is multiplied by the FBT tax rate of 46.5%. So a $20,000 car incurs an annual FBT cost of $3,840 (If reg’d for GST) or $3,477 (if not reg’d for GST). An $80,000 car is simply 4 times more expensive, with an annual FBT cost of $15,361 or $13,907 respectively. The FBT cost is the same across the first 4 years and has no relation to the number of kms travelled or the proportion of private use. However, as the car ownership duration or leasing period ages beyond 4 years, the taxpayer is allowed a 1/3rd reduction in the purchase price and therefore in the FBT tax paid, but only from the first full FBT year following. This means that despite the 1/3rd reduction, the annual FBT cost is likely to exceed the value of the car after about 8 years. One final point, is that in prior years, higher kms travelled pa (business and private included), generally decreased the Statutory rate and therefore the GST paid, but this does not apply from 1st April, 2014. 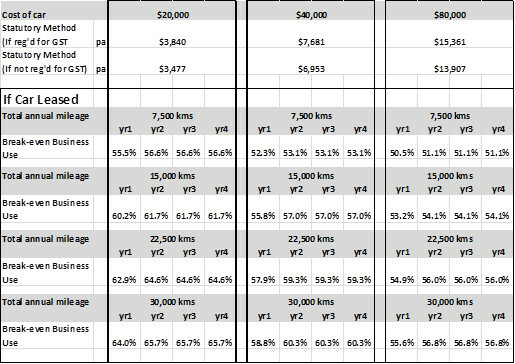 The following table shows firstly the FBT statutory costs pa, for low, medium & high priced cars. Note that a $40,000 car’s FBT is double that of a $20,000 car and the $80,000 car’s FBT is 4 times the $20,000 car’s FBT cost. In addition, the table shows the proportion of business mileage travelled for the operating cost method to break even with the statutory cost method. This of course is dependent on the total mileage travelled. The operating cost method is preferable if your business proportion is higher than the relevant table percentages with consequential lower FBT. (e.g., An $80,000 car with annual Kms of 15,000 in year 4 and 80% business use will incur only $2,968 FBT (if reg’d for GST) under the Operating Cost method compared to $15,361under the Statutory Method. Where the table shows a negative figure, a 0% business use (or 100% private use) will yield a lower FBT cost under the Operating Cost method. Note that the break-even % of business usage varies from a high of 58.8% (for a $20,000 car with high annual mileage in year 1) to less than 0% (for an $80,000 car with low annual mileage in year 4. So under the Operating Cost method, even a low proportion of business use can yield significant FBT savings over the Statutory Cost method, particularly in years 3, 4 or later and particularly for higher priced cars. This next table is similar to the above table, but applies to cars that are leased. In addition, the table shows the proportion of business mileage travelled for the operating cost method to break even with the statutory cost method. This of course is dependent on the mileage travelled. The operating cost method can save significant amounts of GST where the business mileage proportion is above the %’s shown in the above tables. The only effort required is the completion of a log book of business vs. private mileage for 3 months once every 5 years. A car that is owned can generally incur a substantially lower FBT payment than a car that is leased, particularly as the car ages. This is because of the generous deemed depreciation allowance of 25% pa for owned cars. It is important to talk to your accountant about the potential saving and to factor this in to any purchase decision. Note that an owned car can be financed by a general bank loan rather than Leasing. The greater the annual mileage, the greater the % business use that is required to break even with the Statutory Cost method. This is true for owned cars as well as leased cars. 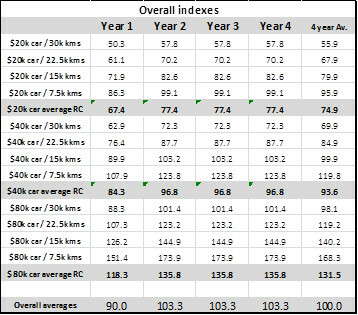 Note that the cost/km ranges from an index of 50.3 or $0.1247/km for a $20,000 car with high annual mileage in year 1, to an index of 173.9 or $0.4310/km for an $80,000 car with low annual mileage in year 4.